The Middle & Junior High Core Collection database is the ideal collection development, readers’ advisory and curriculum support resource for educators and librarians serving readers in grades five through nine. It contains more than 30,000 recommended fiction and nonfiction works for children and adolescents. Indispensable for librarians and school media specialists involved with collection development and user advisory services. Highly recommended. In addition to recommended youth titles, the Middle & Junior High Core Collection database covers review sources and other professional aids for librarians and school media specialists. Entries provide complete bibliographic data, price, subject headings, a descriptive annotation and evaluative quotations from a review when available. Selected and recommended by specialists in library service to young people, listed books encompass a wide variety of topics for youth. Among nonfiction entries, special importance is given to works devoted to technology, personal values, and current social and political issues, with special emphasis on ethnic diversity. Fiction entries encompass a broad spectrum of contemporary and classic fiction and literary works that are of interest to young readers, including many titles that are frequently part of the school curriculum. 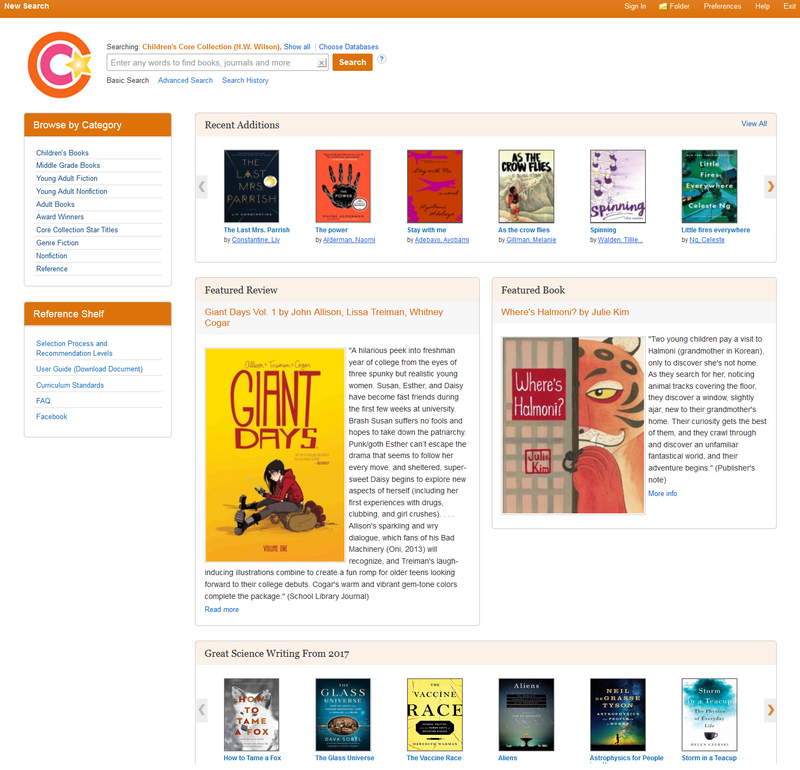 Titles are searchable by subject, author, grade level, Dewey Decimal number and more.